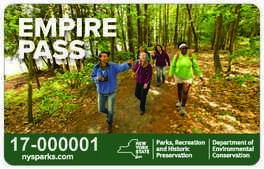 State Parks is now offering a new Empire Pass Card – a wallet-sized plastic card that can be shared among family members including parents, grandparents, caregivers and more. Gone are the days of needing multiple decals on multiple cars for families who enjoy the outdoors. The $80 Empire Pass card will allow parents to take any vehicle to the park, the family babysitter to keep the kids active over the summer, or grandparents to accompany the kids to a weekend nature program - all with one pass. The original Empire Pass decal is still available for $65 and must be affixed to a single vehicle. Buy your pass today! Parks are more popular than ever. Governor Andrew M. Cuomo recently announced New York state parks, historic sites and campgrounds hosted an estimated 69.3 million visitors in 2016, a 6 percent increase over 2015 and a 21 percent increase since in 2011. Park system attendance was boosted by many factors, including major improvements to park facilities taking place under the Governor’s NY Parks 2020 initiative, such as the reopening the historic West Bathhouse at Jones Beach and renewal of Terrapin Point at Niagara Falls; the Connect Kids to Parks program offering free park entry to fourth-graders; an extended swimming season after Labor Day, record overnight visitation at State Park campgrounds; and favorable weather throughout the summer and late into the fall. Read more. There’s still time to enjoy winter’s unique beauty. 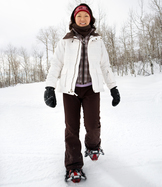 Just grab or borrow a pair of snowshoes and head out to the trail in a nearby park. 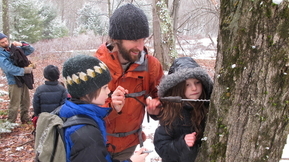 Check out the State Park staff recommendations on their favorite snowshoeing spots. Governor Cuomo’s Executive Budget proposal will double the State’s investment in the Connect Kids program through the Environmental Protection Fund to provide free or low-cost transportation to connect schools in underserved communities with state parks. In addition, State Parks will again accept the National Park Service’s Every-Kid-in-a-Park Pass to grant free entry to State Parks for all 4th graders and their families. Parks will also expand the free or low-cost Learn-to-Swim program to all State Park swimming facilities, serving up to 5,000 youth annually. And, in a partnership with the Office of Children & Families, State Parks will also expand the free Foster Family New Camper program to serve up to 300 New York State foster families and at-risk youth. Funding is still available for Connect Kids field trip transportation grant for the 2016-17 school year. Visit www.nysparks.com for an application and more information! Work as begun on improvements to Fort Niagara State Park, including construction of a modern bathhouse designed to reflect the historic architecture of neighboring Old Fort Niagara. Drawing inspiration from the 1759 fort, the bathhouse includes brick and stone masonry and a shallow sloped roof line. A deep roof overhang will offer shade from the sun and cover from unexpected weather. The project is part of Governor Cuomo’s NY Parks 2020 initiative to revitalize the state park system. 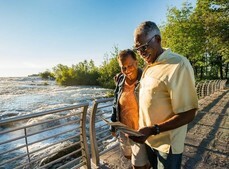 Governor Cuomo’s Executive Budget includes $120 million to continue the success of the NY Parks 2020 initiative, helping reverse decades of decline and neglect in our parks. Since the Governor launched NY Parks 2020 in 2012, State Parks has advanced more than 383 separate projects within 130 parks and historic sites to enhance, restore and repair public facilities. How long have you been volunteering and how did you get involved? 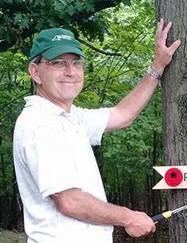 For the last two years I have worked with the Park manager to lead several programs and make improvements to the park as a volunteer. Describe a recent initiative that you participated in: Over the past year, we made significant improvements to the Park’s trails, including new trail markers, signs and benches. Our First Day Hike was the culmination of that work and illustrated why so many visitors love Peebles Island State Park. 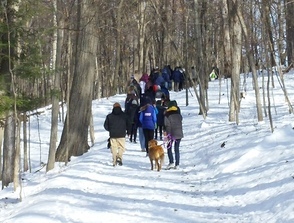 Our First Day Hike was promoted throughout the Capital Region, several volunteers assisted and we were thrilled to host 140 hikers. Our hikers walked the two-mile perimeter trail on the Island viewing the beautiful landscape (formed by the Mohawk and Hudson Rivers) and the abundant wildlife (a large deer herd, resident bald eagles and a variety of other birds). We also presented the rich history of the Island – evidence of nearly 2,000 years of Mahican presence, early Dutch settlement, and the encampment of the Continental Army in 1777. As we commonly hear, most visitors stated, “We never knew this beautiful Island existed and we’ll definitely return.” Twenty-five participants have since offered to be volunteers. Is there anything else you’d like to add? Our real work is ahead of us. We need to organize a Friends Group, bring on more volunteers, and work with Park staff to outfit the Visitor Center to best present the history and environment of the Island to enhance our visitors’ experience. We look forward to an exciting future! 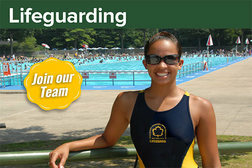 Are you a strong swimmer, love to be outdoors and looking for a summer job that helps people? Plan now and join the State Parks Lifeguard team. Dates to qualify have started: find a location near you. How long have you been with the agency? Twenty-five years. What does someone in your position do? 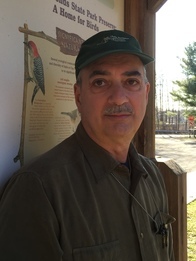 In addition to managing Clay Pit Ponds on Staten Island and co-managing Bayswater Point Preserve in Queens, I help oversee the region’s “Green Team” and am involved with all horticultural matters for the region’s parks. I also oversee the Risk Tree Assessment program, teach horticulture classes and oversee film shoots as they occur. What’s one of the coolest things you’ve seen or done? While I was overseeing a project at Bayswater a patron notified me that there was a young seal near the water in Jamaica Bay and wanted to make sure it wasn’t injured. I investigated and found the young Harbor Seal sitting on a sand bar. I was able to get up close enough that I didn’t see any visible wounds so I got out my camera and took a picture and left it to continue basking in the sun. Is there a destination in the park you’d recommend? I suggest visiting our Nature Interpretive Center, with its wonderful exhibits and history timeline, and then take the Clay Pit Pond trail, with its beautiful vistas and of course the park’s namesake-Clay Pit Pond. What inspired you to work in the park system? I interviewed at Heckscher State Park in 1992 for a horticulturist position. The park manager explained that I would be responsible for growing all of the annuals, perennials and bedding plants for the entire Long Island Region. The WOW factor kicked in and I thought that if I were hired, I would be part of something great; I would be helping to beautify our parks for our patrons who come from all over the state, country and the world.